or make it. Photo courtesy Tribe Hummus. Like horseradish? Add it to your hummus. Several hummus manufacturers make hummus with horseradish, although it’s not as easy to find as more mainstream flavors like garlic hummus and red pepper hummus. 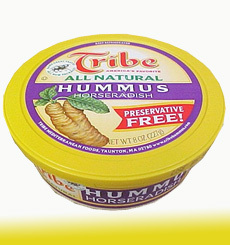 Lucky us: One of our local markets had a stack of Tribe Hummus With Freshly Ground Horseradish. (And here’s a $1.00 coupon for any flavor.) It is heady with horseradish, and we love it. If you don’t have a favorite hummus recipe, here’s one from Nanoosh Mediterranean Hummus Bars & Counters in New York City. Or, for instant gratification, buy plain hummus and add well-drained prepared horseradish to taste. 1. Soak the chickpeas in water a day ahead. 2. Cook the chickpeas in boiling water for approximately 2 hours. Drain and chill the chickpeas. 3. Place the chickpeas in a food processor with the other ingredients. Process until smooth. 4. Taste and adjust to taste by adding lemon juice, water, salt and/or flavoring/spice/herb. Since this recipe makes approximately two pounds of hummus, or four of the larger store containers, you can divide the batch and make up to four different flavors. Breakfast: Add prepared horseradish to scrambled eggs, omelets and hash brown potatoes before cooking. Add a spoonful to the hollandaise sauce for Eggs Benedict. Or serve as a condiment. Lunch: Add prepared horseradish to mayonnaise for sandwiches or to vinaigrette or other salad dressing. Mix with ketchup for spicy ketchup, and mix with sour cream for your baked potato. Add a heaping spoonful to ready-made deli items such as cole slaw, baked beans and potato salad. Dinner: substitute prepared horseradish for butter and salt as a vegetable topper. Add one (or two) spoonfuls to canned or homemade soups. Mash horseradish with potatoes or mix with low-fat sour cream for a quick baked potato topping. Horseradish is good for you. Its use as a remedy for illness dates to the ancient Egypt—most popularly to clear breathing passages that are congested from colds. Horseradish contains calcium, magnesium, phosphorus and potassium. The spice and heat come from mustard oil (the root is in the same family as mustard), which, as with mustard seed, is released when it is ground. And horseradish is high in glucosinolates and phytonutrients, potential cancer-fighting agents that have shown in clinical studies to keep tumor growth under control and reduce the chance of developing new tumors.